I dedicate it to Jim Gilliam. Jim Gilliam made his major league debut in 1953. Quoting Jim Murray: They broke him in easy. All he had to do the first year was replace Jackie Robinson. He proved capable, batting .278 with a team-leading 125 runs for the NL champions. 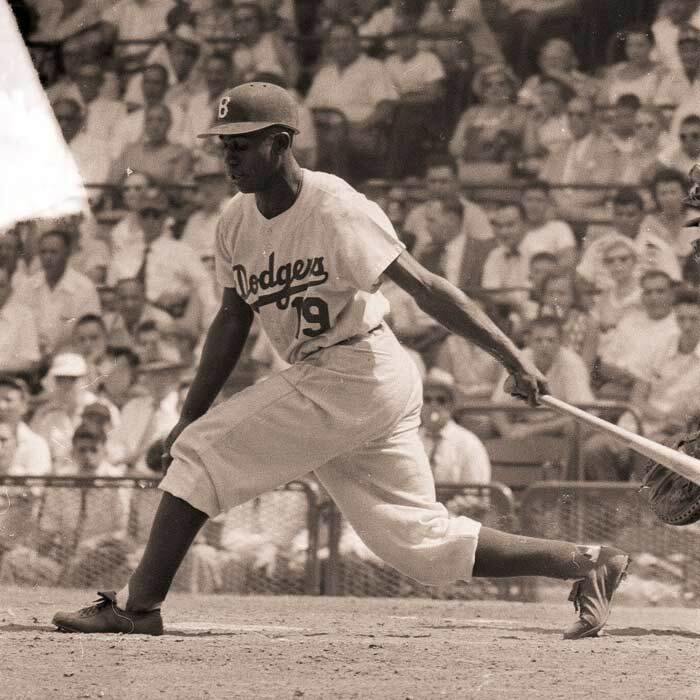 His 17 triples led the NL, and remain the most by a Dodger since 1920; he was second in the league (behind Stan Musial) with 100 walks, and third in the NL with 21 stolen bases. For his excellent season he earned NL Rookie of the Year honors, as well as The Sporting News Rookie of the Year Award. Junior was part of the first all switch hitting infield in Major League history, with Maury Wills, Wes Parker, and Jim Lefebvre. Gilliam hit behind Maury Wills when he launched the modern stolen base era with 104 in 1962. He was the ultimate team player sacrificing himself for the good of the team. Gilliam contributed to four World Series clubs and seven pennant winners. His glove is on display in Cooperstown. The Dodgers used him at every position in the field except for pitcher and catcher. In 1965 he was replaced at third base and became a first base coach but after injuries and dismal hitting average at third, the Dodgers activated Gilliam who went on to contribute with his hitting. Jim Gilliam passed away prior to the start of the 1978 World Series at which time his number was retired and the Dodgers wore a commemorative patch on their sleeve in his honor. I love reading old columns from Jim Murray. In Colorado: Dodgers stop the losing streak by winning 6-2! Wow, he had some huge shoes to fill, and turned that challenge into a great career! Congrats on being #19, too. Thanks Mike. For all of Jim’s 14 years as a players he was always hearing rumors of being traded. Upcoming Dodger Road Trip & SABR Convention. I Can’t Wait!